2006-10-13 Assigned to 3M INNOVATIVE PROPERTIES COMPANY reassignment 3M INNOVATIVE PROPERTIES COMPANY ASSIGNMENT OF ASSIGNORS INTEREST (SEE DOCUMENT FOR DETAILS). Assignors: ANDERSON, KELLY S., FANSLER, DUANE D., GADDAM, BABU N., JOSEPH, EUGENE G., LEWANDOWSKI, KEVIN M.
A pressure sensitive adhesive composition comprising a 2-octyl (meth)acrylate/(meth)acrylic acid copolymer and a crosslinking agent is described. The adhesive composition may be derived from renewable resources and provides good peel, shear and high temperature stability. Only a limited number of classes of polymers have been found to function as PSAs. Among these polymer classes are natural and synthetic rubbers, (meth)acrylic polymers, silicones, block copolymers and olefins. Acrylic polymers have proven especially useful. Acrylic based PSAs are frequently prepared from isooctyl acrylate or 2-ethylhexyl acrylate. These adhesives have many desirable attributes such as high peel adhesion when applied to a wide variety of surfaces. Acrylic PSAs, however, do not typically provide high thermal stability and will slowly degrade upon exposure to higher temperature (e.g., above 125° C.). Thermal degradation of these known acrylic adhesives at higher temperatures reduces the cohesive strength of the adhesive and may generate bubble formation from high levels of outgassing, resulting in a loss of adhesion. It is desirable to provide silicone-free PSAs that will strongly adhere to surfaces at temperatures up to at least about 175° C. or even higher temperatures. The present invention provides an adhesive composition derived from renewable resources. In particular, the present invention provides an adhesive composition derived, in part, from plant materials. In some embodiments, the present invention further provides an adhesive article, wherein the substrate or backing is also derived from renewable resources. The pressure sensitive adhesive composition comprises a 2-octyl (meth)acrylate/(meth)acrylic acid copolymer and a crosslinking agent. The pressure sensitive adhesive of the invention comprises the reaction product of the same. As used herein (meth)acrylate or (meth)acrylic is inclusive of methacrylate and acrylate. The present invention provides a pressure sensitive (meth)acrylic adhesive that may be useful for adhering substrates that are exposed to high temperatures. The adhesive exhibits low outgassing or weight loss at elevated temperatures. Surprisingly, the adhesive of the invention typically exhibits a total weight loss of no greater than about 5 wt. % after 3.5 hours at 175° C. as determined by the test method described in the Examples. The adhesive composition may be extruded, coated, or sprayed directly onto a substrate or surface that is to be bonded to another substrate or surface. The present adhesive composition, derived from 2-octyl (meth)acrylate, provides comparable adhesive properties when compared with other isomers of octyl (meth)acrylate, such as n-octyl and isoctyl. Further, the present adhesive compositions have lower viscosities than adhesives derived form other octyl isomers, such as isooctyl acrylate. The lower viscosity compositions advantageously are easier to coat. 2) 0.5 to 10 wt. % of a carboxylic acid functional comonomer, preferably 1 to 7 wt. %. The 2-octyl (meth)acrylate may be prepared by conventional techniques from 2-octanol and (meth)acryloyl derivatives such as esters, acids and acyl halides. The 2-octanol may be prepared by treatment of ricinoleic acid, derived from castor oil, (or ester or acyl halide thereof) with sodium hydroxide, followed by distillation from the co-product sebacic acid. Up to 10% by weight based on the total weight of monomers of other monomers, such as monomers used to raise the Tg of the copolymer, may be used in addition to monomers (1) and (2) above in the adhesive copolymer. For example, ethylenically unsaturated monomers whose homopolymers have a Tg of at least about 0° C., preferably greater than 20° C., may be used. Examples of other monomers that may be co-polymerized with the (meth)acrylate ester and carboxylic acid-functional monomers include (meth)acrylamides, alpha-olefins, vinyl ethers, allyl ethers, styrene and other aromatic vinyl compounds, maleic acid esters, 2-hydroxyethyl (meth)acrylate, cyclohexyl (meth)acrylate, t-butyl (meth)acrylate, phenyl (meth)acrylate, 2-phenoxyethyl (meth)acrylate, N-vinyl pyrrolidone, N-vinyl caprolactam, and substituted (meth)acrylamides such as N-ethyl (meth)acrylamide, N-hydroxyethyl (meth)acrylamide, N-octyl (meth)acrylamide, N-t-butyl (meth)acrylamide, N,N-dimethyl (meth)acrylamide, N,N-diethyl (meth)acrylamide, and N-ethyl-N-dihydroxyethyl (meth)acrylamide. The copolymerizable mixture may optionally further comprise chain transfer agents to control the molecular weight of the resultant polymer. Examples of useful chain transfer agents include but are not limited to those selected from the group consisting of carbon tetrabromide, alcohols, mercaptans, and mixtures thereof. When present, the preferred chain transfer agents are isooctylthioglycolate and carbon tetrabromide. The polymerization mixture may further comprise up to about 0.5 parts by weight of a chain transfer agent, typically about 0.01 to about 0.5 parts by weight, if used, preferably about 0.05 parts by weight to about 0.2 parts by weight, based upon 100 parts by weight of the total monomer mixture. However, the use of a chain transfer agent is generally not necessary. Applicants have discovered that the instant 2-octyl (meth)acrylate adhesives have generally lower inherent and solution viscosities when compared to isomeric octyl (meth)acrylates, at the same concentrations, and under the same polymerization conditions. While not wishing to be bound by theory, it is believed that the instant octyl (meth)acrylates, having a tertiary hydrogen atom alpha to the ester hydroxyloxygen atom, serve as “internal” chain transfer agents to control the molecular weight. In the practice of the invention, the copolymers can be polymerized by techniques including, but not limited to, the conventional techniques of solvent polymerization, dispersion polymerization, and solventless bulk polymerization, and radiation polymerization, including processes using ultraviolet light, electron beam, and gamma radiation. The monomer mixture may comprise a polymerization initiator, especially a thermal initiator or a photoinitiator of a type and in an amount effective to polymerize the comonomers. Suitable initiators include but are not limited to those selected from the group consisting of azo compounds such as VAZO 64 (2,2′-azobis(isobutyronitrile)), VAZO 52 (2,2′-azobis(2,4-dimethylpentanenitrile)), and VAZO 67 (2,2′-azobis-(2-methylbutyronitrile)) available from E.I. du Pont de Nemours Co., peroxides such as benzoyl peroxide and lauroyl peroxide, and mixtures thereof. The preferred oil-soluble thermal initiator is (2,2′-azobis-(2-methylbutyronitrile)). When used, initiators may comprise from about 0.05 to about 1 part by weight, preferably about 0.1 to about 0.5 part by weight based on 100 parts by weight of monomer components in the pressure sensitive adhesive. In a typical photopolymerization method, a monomer mixture may be irradiated with ultraviolet (UV) rays in the presence of a photopolymerization initiator (i.e., photoinitiators). Preferred photoinitiators are those available under the trade designations IRGACURE and DAROCUR from Ciba Speciality Chemical Corp., Tarrytown, N.Y. and include 1-hydroxy cyclohexyl phenyl ketone (IRGACURE 184), 2,2-dimethoxy-1,2-diphenylethan-1-one (IRGACURE 651), bis(2,4,6-trimethylbenzoyl)phenylphosphineoxide (IRGACURE 819), 1-[4-(2-hydroxyethoxy)phenyl]-2-hydroxy-2-methyl-1-propane-1-one (IRGACURE 2959), 2-benzyl-2-dimethylamino-1-(4-morpholinophenyl)butanone (IRGACURE 369), 2-methyl-1-[4-(methylthio)phenyl]-2-morpholinopropan-1-one (IRGACURE 907), and 2-hydroxy-2-methyl-1-phenyl propan-1-one (DAROCUR 1173). Particularly preferred photoinitiators are IRGACURE 819, 184 and 2959. In order to increase cohesive strength of the poly(meth)acrylate pressure sensitive adhesives, a crosslinking agent may be incorporated into the adhesive composition. Two main types of chemical crosslinking agents are exemplary. The first crosslinking additive is a thermal crosslinking agent such as multifunctional aziridine, isocyanate, oxazole and epoxy compounds. One example of aziridine crosslinker is 1,1′-(1,3-phenylene dicarbonyl)-bis-(2-methylaziridine) (CAS No. 7652-64-4). Other bisamide crosslinking agents are described in U.S. Pat. No. 6,893,718 (Melancon et al. ), incorporated herein by reference. Common polyfunctional isocyanate crosslinkers are trimethylolpropane toluene diisocyanate, toluene diisocyanate, and others known in the art. Such chemical crosslinkers can be added into solvent-based PSAs after polymerization and activated by heat during oven drying of the coated adhesive. R2 is a divalent radical selected from the group consisting of phenyl, substituted phenyl, triazine, and —CnH2m−, where m is an integer ranging from 1 to 10, and combinations thereof. Useful multifunctional oxazoline crosslinking agents include but is not limited to 4,4′-5,5′-tetrahydro-2,2′-bisoxazole, (that is, 2,2′-bis(2-oxazoline)); 2,2′-(alkanediyl)bis[4,5-dihydrooxazole], for example, 2,2′-(1,4-butanediyl)bis[4,5-dihydrooxazole] and 2,2′-(1,2-ethanediyl)bis[4,5-dihydrooxazole]; 2,2′-(arylene)bis[4,5-dihydrooxazole], e.g., 2,2′-(1,4-phenylene)bis[4,5-dihydrooxazole]; 2,2′-(1,5-naphthalenyl)bis[4,5-dihydrooxazole] and 2,2′-(1,8-anthracenyl)bis[4,5-dihydrooxazole]; sulfonyl, oxy, thio or alkylene bis 2-(arylene)[4,5-dihydrooxazole], for example, sulfonyl bis 2-(1,4-phenylene)bis[4,5-dihydrooxazole], oxybis 2-(1,4-phenylene)bis[4,5-dihydrooxazole], thiobis 2-(1,4-phenylene)bis[4,5-dihydrooxazole] and methylene bis 2-(1,4-phenylene)bis[4,5-dihydrooxazole]; 2,2′,2″-(arylene tris[4,5-dihydrooxazole], e.g., 2,2′,2″-(1,3,5-phenylene tris[4,5-dihydrooxazole]; 2,2′,2″,2′″-(arylene tetra[4,5-dihydrooxazole], for example, 2,2′,2″,2′″-(1,2,4,5-phenylene tetra[4,5-dihydrooxazole] and oligomeric and polymeric materials having terminal oxazoline groups. The use of such tack modifiers is common in the art, as is described in the Handbook of Pressure Sensitive Adhesive Technology, Second Edition, D. Satas, ed., Van Nostrand Reinhold, New York, N.Y., 1989. A tackifying resin is added in amounts required to achieve the desired tack level. Examples of suitable commercially available tackifiers include synthetic ester resins, such as that available under the trade designation FORAL 85 from Hercules Inc., Wilmington, Del., and aliphatic/aromatic hydrocarbon resins, such as those available under the trade designation ESCOREZ 2000 from Exxon Chemical Co., Houston, Tex. This is typically achieved by adding from 1 part to about 300 parts by weight of tackifying resin per 100 parts by weight of an acrylate copolymer. The tackifying resin is selected to provide the acrylate copolymers with an adequate degree of tack to maintain the resultant composition balanced pressure sensitive adhesive properties including shear and peel adhesion. As is known in the art, not all tackifier resins interact with the acrylate copolymer in the same manner; therefore, some minor amount of experimentation may be required to select the appropriate tackifier resin and to achieve optimum adhesive performance. Such minor experimentation is well within the capability of one skilled in the adhesive art. Particularly useful plasticizing agents include polyalkylene oxides having weight average molecular weights of about 150 to about 5,000, preferably of about 150 to about 1,500, such as polyethylene oxides, polypropylene oxides, polyethylene glycols; alkyl or aryl functionalized polyalkylene oxides, such as PYCAL 94 (a phenyl ether of polyethylene oxide, commercially available from ICI Chemicals); benzoyl functionalized polyethers, such as BENZOFLEX 400 (polypropylene glycol dibenzoate, commercially available from Velsicol Chemicals) and monomethyl ethers of polyethylene oxides; monomeric adipates such as dioctyl adipate, dibutoxyethoxyethyl adipate and dibutoxypropoxypropyl adipate; polymeric adipates such as polyester adipates; citrates, such as acetyltri-n-butyl citrate, phthalates such as butyl benzylphthalates, trimellitates, sebacates, polyesters, such as those known under the tradename Paraplex (available from C.P. Hall Co); phosphate esters, such as those known under the tradename of Santicizer (available from Ferro) such as 2-ethylhexyl diphenyl diphosphate and t-butylphenyl diphenyl phosphate; glutarates such as Plasthall 7050 (a dialkyl diether glutarate available from C.P. Hall Co.); and mixtures thereof. The plasticizing agent may be used in amounts of from about 1 to 100 parts by weight per 100 parts of the copolymer. In some embodiments, the plasticizing agent is present in amounts from about 3 to 50 pph. Most preferably, the plasticizing agent is present in amounts up to 10 wt. % plasticizer, relative to the weight of the copolymer. The pressure sensitive adhesive composition can be applied to any suitable substrate that can be a sheet, a fiber, or a shaped article. However, the preferred substrates are those used for pressure sensitive adhesive products. The pressure sensitive adhesive composition can be applied to at least one major surface of suitable flexible or inflexible backing materials before crosslinking is initiated. Typical examples of flexible backing materials employed as conventional tape backing that may be useful for the adhesive compositions include those made of paper, plastic films such as polypropylene, polyethylene, polyester (e.g., polyethylene terephthalate), cellulose acetate, and ethyl cellulose. Backings may also be prepared of fabric such as woven fabric formed of threads of synthetic or natural materials such as cotton, nylon, rayon, glass, ceramic materials, and the like or nonwoven fabric such as air laid webs of natural or synthetic fibers or blends of these. The backing may also be formed of metal, metallized polymer films, or ceramic sheet materials may take the form of any article conventionally known to be utilized with pressure sensitive adhesive compositions such as labels, tapes, signs, covers, marking indicia, and the like. Preferably, the adhesive article comprises a backing of aliphatic polyester. Aliphatic polyesters useful in the present invention include homo- and copolymers of poly(hydroxyalkanoates) and homo- and copolymers of those aliphatic polyesters derived from the reaction product of one or more alkanediols with one or more alkanedicarboxylic acids (or acyl derivatives). Miscible and immiscible blends of aliphatic polyesters with one or more additional semicrystalline or amorphous polymers may also be used. One useful class of aliphatic polyesters are poly(hydroxyalkanoates), derived by condensation or ring-opening polymerization of hydroxy acids, or derivatives thereof. Suitable poly(hydroxyalkanoates) may be represented by the formula H(O—R4—C(O)—)xOH, where R4 is an alkylene moiety having 1 to 20 carbon atoms, preferably 1 to 12 carbon atoms, that may be linear or branched. “x” is a number such that the ester is polymeric, and is preferably a number such that the molecular weight of the aliphatic polyester is 10,000 to 300,000 and is preferably from about 30,000 to 200,000. R4 may further comprise one or more catenary (i.e. in chain) ether oxygen atoms. Generally the R4 group of the hydroxyl acid is such that the pendant hydroxyl group is a primary or secondary hydroxyl group. Useful poly(hydroxyalkanoates) include, for example, homo- and copolymers of poly(3-hydroxybutyrate), poly(4-hydroxybutyrate), poly(3-hydroxyvalerate), poly(lactic acid) (as known as polylactide), poly(3-hydroxypropanoate), poly(4-hydropentanoate), poly(3-hydroxypentanoate), poly(3-hydroxyhexanoate), poly(3-hydroxyheptanoate), poly(3-hydroxyoctanoate), polydioxanone, and polycaprolactone, polyglycolic acid (also known as polyglycolide). Copolymers of two or more of the above hydroxy acids may also be used, for example, poly(3-hydroxybutyrate-co-3-hydroxyvalerate), poly(lactate-co-3-hydroxypropanoate) and poly(glycolide-co-p-dioxanone). Blends of two or more of the poly(hydroxyalkanoates) may also be used, as well as blends with one or more semicrystalline or amorphous polymer. where R5 and R6 each represent an alkylene moiety that may be linear or branched having from 1 to 20, preferably 1 to 12 carbon atoms, and z is a number such that the ester is polymeric, and is preferably a number such that the molecular weight of the aliphatic polyester is 10,000 to 300,000 and is preferably from about 30,000 to 200,000. Each y is independently 0 or 1. R5 and R6 may further comprise one or more catenary (i.e. in chain) ether oxygen atoms. 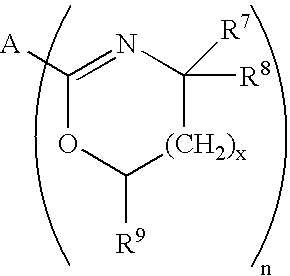 Examples of aliphatic polyesters include those homo- and copolymers derived from (a) one or more of the following diacids (or derivative thereof): succinic acid, adipic acid, 1,12 dicarboxydodecane, fumaric acid, and maleic acid and (b) one of more of the following diols: ethylene glycol, polyethylene glycol, 1,2-propane diol, 1,3-propanediol, 1,2-propanediol, 1,2-butanediol, 1,3-butanediol, 1,4-butanediol, 1,6-hexanediol, diethylene glycol, and polypropylene glycol, and (c) optionally a small amount, i.e. 0.5-7.0 mole % of a polyol with a functionality greater than two such as glycerol, neopentyl glycol, and pentaerythritol. Such polymers may include polybutylenesuccinate homopolymer, polybutylene adipate homopolmer, polybutyleneadipate-succinate copolymer, polyethylenesuccinate-adipate copolymer, polyethylene adipate homopolymer. Commercially available aliphatic polyesters include polylactide, polyglycolide, polylactide-co-glycolide, poly(L-lactide-co-trimethylene carbonate), poly(dioxanone), poly(butylene succinate), and poly(butylene adipate). Especially useful aliphatic polyesters include those derived from semicrystalline polylactic acid. Polylactic acid (or polylactides) has lactic acid as its principle degradation product, which is commonly found in nature, is non-toxic and is widely used in the food, pharmaceutical and medical industries. The polymer may be prepared by ring-opening polymerization of the lactic acid dimer, lactide. Lactic acid is optically active and the dimer appears in four different forms: L,L-lactide, D,D-lactide, D,L-lactide (meso lactide) and a racemic mixture of L,L- and D,D-. By polymerizing these lactides as pure compounds or as blends, polylactide polmers may be obtained having different stereochemistries and different physical properties, including crystallinity. The L,L- or D,D-lactide yields semicrystalline polylactide and are preferred, while the polylactide derived from the D,L-lactide is amorphous. Copolymers, including block and random copolymers, of poly(lactic acid) with other aliphatic polyesters may also be used. Useful co-monomers include glycolide, beta-propiolactone, tetramethyglycolide, beta-butyrolactone, gamma-butyrolactone, pivalolactone, 2-hydroxybutyric acid, alpha-hydroxyisobutyric acid, alpha-hydroxyvaleric acid, alpha-hydroxyisovaleric acid, alpha-hydroxycaproic acid, alpha-hydroxyethylbutyric acid, alpha-hydroxyisocaproic acid, alpha-hydroxy-beta-methylvaleric acid, alpha-hydroxyoctanoic acid, alpha-hydroxydecanoic acid, alpha-hydroxymyristic acid, and alpha-hydroxystearic acid. Blends of poly(lactic acid) and one or more other aliphatic polyesters, or one or more other polymers may also be used in the present invention. Examples of useful blends include poly(lactic acid) and poly(vinyl alcohol), polyethylene glycol/polysuccinate, polyethylene oxide, polycaprolactone and polyglycolide. Useful polylactides may be prepared as described in U.S. Pat. No. 6,111,060 (Gruber, et al. ), U.S. Pat. No. 5,997,568 (Liu), U.S. Pat. No. 4,744,365 (Kaplan et al. ), U.S. Pat. No. 5,475,063 (Kaplan et al. ), WO 98/24951 (Tsai et al. ), WO 00/12606 (Tsai et al. ), WO 84/04311 (Lin), U.S. Pat. No. 6,117,928 (Hiltunen et al. ), U.S. Pat. No. 5,883,199 (McCarthy et al. ), WO 99/50345 (Kolstad et al. ), WO 99/06456 (Wang et al. ), WO 94/07949 (Gruber et al. ), WO 96/22330 (Randall et al. ), WO 98/50611 (Ryan et al. ), U.S. Pat. No. 6,143,863 (Gruber et al. ), U.S. Pat. No. 6,093,792 (Gross et al. ), U.S. Pat. No. 6,075,118 (Wang et al. ), and U.S. Pat. No. 5,952,433 (Wang et al. ), the disclosure of each U.S. patent incorporated herein by reference. Reference may also be made to J. W. Leenslag, et al., J. Appl. Polymer Science, vol. 29 (1984), pp 2829-2842, and H. R. Kricheldorf, Chemosphere, vol. 43, (2001) 49-54. The coating thickness will vary depending upon various factors such as, for example, the particular application, the coating formulation, and the nature of the substrate (e.g., its absorbency, porosity, surface roughness, crepe, chemical composition, etc.). Coating thicknesses of 2-250 micrometers (dry thickness), preferably about 25 to 200 micrometers, are contemplated. The coatable adhesive composition may be of any desirable concentration for subsequent coating, but is typically between 30 to 70 wt. % solids, and more typically between 50 and 35 wt. % solids, with the remainder solvent. The desired concentration may be achieved by further dilution of the adhesive composition, or by partial drying. Generally, the adhesive composition is coated on the backing and heated to effect the crosslinking. The flexible support or backing may also comprise a release-coated substrate. Such substrates are typically employed when an adhesive transfer tape is provided. Examples of release-coated substrates are well known in the art. They include, by way of example, silicone-coated kraft paper and the like. Tapes of the invention may also incorporate a low adhesion backsize (LAB). Typically this LAB is applied to the tape backing surface that is opposite that bearing the pressure sensitive adhesive. LABs are known in the art. The peel adhesion test method used was similar to test method ASTM D 3330-78 except that a glass substrate was used in place of stainless steel. Two 1.3 centimeter (0.5 inch) strips of sample tapes were adhered to a glass plate by rolling a 2 kilogram (4.5 pounds) roller onto the tape. The bonded assembly dwelled at room temperature for about one minute and was tested for 180° peel adhesion using an IMASS slip/peel tester (Model 3M90, commercially available from Instrumentors Inc., Strongsville, Ohio) at a rate of 229 centimeters per minute (90 inches per minute). Peel force was measured in ounces per 0.5 inch and converted to Newtons per decimeter (N/dm). The tests were run at 23° C. and 50% relative humidity unless otherwise specified. The shear strength test method used was similar to test method ASTM D-3654-78, PSTC-7. Strips of sample tapes 1.3 centimeter (0.5 inch) wide were adhered to stainless steel plates and cut down to leave 1.3 centimeter by 1.3 centimeter (0.5 inch by 0.5 inch) square on the steel plates. A weight of 2 kilograms (4.5 pounds) was rolled over the adhered portion. A weight of 1,000 grams was attached to each sample which was suspended until the sample failed. The time of failure as well as the mode of failure was noted (adhesive, cohesive, or mixed). Cohesive failure means that adhesive is left both on the steel plate and the film, adhesive failure means that no adhesive is left on the steel plate and mixed means that some adhesive is left on the steel plate. Samples were run in triplicate and averaged. The tests were run at 23° C. and 50% relative humidity unless otherwise specified. In some cases the same test was run with fiberboard (FB) as the substrate. For Examples 1 and 2 solution co-polymerizations of 2-OA with AA were performed by combining the materials shown in Table 1 in a glass jar, purging with nitrogen for 15 minutes, and sealing the jars. The jars were placed in a 60° C. water bath oscillating at 110 rpm for 18-20 hours. The same procedure was used for Comparative Examples C1 and C2 except that IOA was used instead of 2-OA. The molecular weight (Mw) and PDI of the resulting polymers were determined using GPC and the Inherent viscosities (IV) were measured using a #50 viscometer tube at a solution concentration of 0.5 grams/deciliter in THF. These data are presented in Table 1 below. To prepare tape samples, 10.0 grams of the solutions prepared in Table 1 above were placed into a vial along with the corresponding amount of B-212 chemical crosslinker. The amount of B-212 in the formulations was varied from 0 to 0.3 weight % as shown in Table 2. The resulting solutions were coated with a knife coater onto a primed PET film. The knife height was set to 102-127 micrometers (4-5 mils) above the polyester to get a coating that is about 25 micrometers (1 mil) when dried. The coated solution was allowed to air dry for 2 minutes to remove the solvent. The coated PET sheet was then taped onto a thin aluminum panel and placed into an oven at 70° C. for 5 minutes. After the sample was removed from the oven, a release liner was placed on the adhesive to protect the coating. The coated films were allowed to equilibrate in a constant temperature/constant humidity (23° C./50% Relative Humidity) room for 24 hours prior to testing. The tape testing was performed as described in the test methods above, the data are presented in Table 2. For Examples 3-5 solution co-polymerizations of 2-OA with AA were performed by combining the materials shown in Table 3 in a glass jar, purging with nitrogen for 15 minutes, and sealing the jars. The jars were placed in a 60° C. water bath oscillating at 110 rpm for 24 hours. The same procedure was used for Comparative Examples C3-C5 except that IOA was used instead of 2-OA. The Inherent viscosities (IV) were measured using a 50 viscometer tube at a solution concentration of 0.5 grams/deciliter in THF. Brookfield viscosity was measured at room temperature using a Brookfield viscometer (measured in centipoise and converted to Pascal Seconds). These data are presented in Table 3 below. For Examples 6-7 solution co-polymerizations of 2-OA with AA were performed as described in Examples 1-2 with the weight ratios of monomers shown in Table 4. The same procedure was used for Comparative Examples C6-C7 except that IOA was used instead of 2-OA. To prepare thermal stability testing samples, solution polymers with varying compositions were prepared following the general procedure described in Part 1 above. The polymer solutions were then placed into a vial along with the corresponding amount of B-212 chemical crosslinker. The weight % of B-212 is shown in Table 4. This solution was coated with a knife coater onto a silicone release liner. The knife height was set to 254 micrometers (10 mils) above the liner. The coated solution was allowed to air dry for 5 minutes to remove the solvent. The coated film was then taped onto a thin aluminum panel and placed into an oven at 150° C. for 2 minutes. The coated adhesives were allowed to equilibrate in constant temperature/constant humidity (CT/CH) room for 24 hours prior to testing. To determine the degradation onset temperature, a sample of the adhesive (approximately 20-30 milligrams) was analyzed using a TA Instruments TGA 2950 Thermogravimetric Analyzer (TA Instruments Inc., New Castle, Del.). The sample was subjected to a temperature ramp from room temperature to 500° C. at a rate of 10° C./min. The onset point of degradation was then determined from the sample weight versus temperature plot (calculated using the TA Instruments Universal Analysis software). In addition, the thermal stability of the adhesives at 150° C. and 175° C. were determined. Using the TA Instruments TGA 2950 Thermogravimetric Analyzer, the sample temperature was increased from room temperature to the desired set point (either 150° C. or 175° C.) at 200° C./min and kept at the set point for 3.5 hrs. The sample weight was monitored and the % weight loss after 3.5 hrs was determined based on the original weight of the sample. The data are presented in Table 4. For Examples 8-11 solution co-polymerizations of 2-OA with AA were performed as described in Examples 1-2 above with the weight ratios shown in Table 5. To prepare tape samples, portions of the solutions prepared in Part 1 above were placed into a vial along with the corresponding amount of B-212 chemical crosslinker and SANTICIZER 141 plasticizer as shown in Table 5. These mixtures were coated on PLA film with a knife coater using the method described in Examples 1-2. The coated solution was allowed to air dry for 2 minutes to remove the solvent. The coated film was then taped onto a thin aluminum panel and placed into an oven at 70° C. for 5 minutes. A release liner was then placed over the coated adhesives and they were allowed to equilibrate in constant temperature/constant humidity (CT/CH) room for 24 hours prior to testing. Shear strength testing on both stainless steel (SS) and fiber board (FB) substrates was performed as described in the test methods above and the results are shown in Table 5. 2. The adhesive composition of claim 1, wherein the crosslinking agent is selected from multifunctional aziridine, isocyanate, oxazole and epoxy compounds. 4. The adhesive composition of claim 3 wherein the relative amounts of said (meth)acrylic acid comonomer and said crosslinking agent is such that the ratio of said amide groups of the crosslinking agent to the acid functional groups of the (meth)acrylic acid comonomer is less than or equal to 0.1. 5. The adhesive composition of claim 1 wherein the (meth)acrylic acid comonomer is selected from the group consisting of acrylic acid, methacrylic acid, and combinations thereof. 6. The pressure adhesive composition of claim 3 wherein the crosslinking agent comprises 1,1′-isophthaloyl-bis(2-methylaziridine). 7. The adhesive composition of claim 1 wherein said copolymer consists essentially of 90 to 99.5 wt. % of 2-octyl (meth)acrylate; and 0.5 to 10 wt. % of a (meth)acrylic acid comonomer. 8. The adhesive composition of claim 1, further comprising up to 10 wt. % plasticizer, relative to the weight of the copolymer. 9. The adhesive composition of claim 3 wherein the relative amounts of said (meth)acrylic acid comonomer and said crosslinking agent is such that the ratio of said amide groups of the crosslinking agent to the acid functional groups of the (meth)acrylic acid comonomer is less than 0.05. Kricheldorf, H.R., "Syntheses and application of polylactides", Chemosphere, vol. 43, (2001) pp. 49-54. Leenslag , J.W., et al., "Resorbable Materials of Poly(L-lactide). V. Influence of Secondary Structure on the Mechanical Properties and Hydrolyzability of Poly(L-lactide) Fibers Produced by a Dry-Spinning Method", J.Appl.Polymer Science, vol. 29 (1984), pp. 2829-2842.